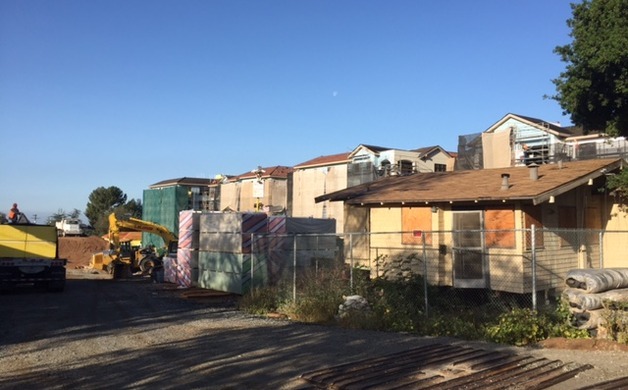 With the historic Gloria Cottage in the foreground, MonteCerdro is two-thirds complete as of March 2015. MonteCedro is on track to open for business in December, and is already 90% sold, representatives told the Altadena Chamber of Commerce. At the Chamber’s regular monthly meeting Tuesday, April 8, 2015, MonteCedro Executive Director David Weidert said that they hope to add 100 jobs to the local economy once the retirement community is running. The Episcopal Communities & Services-owned retirement development is 66 percent complete, Weidart said. The development is looking to get a temporary certificate of occupancy in November to open the building to staff, and looking for full certification in December to allow residents to move in. The current MonteCedro brochure says that residents will enjoy a bar, a bistro, and a fine dining restaurant, “Marcell’s” (which sounds a lot like the “Marcell Inn,” a notorious speakeasy during Prohibition that operated near the site of the current Community Garden). There will also be a fitness center with personal trainers, a spa, and swimming pool. While 186 of the apartments will be for independent living seniors, there will be areas set aside for those who need assisted living and a ten bed memory support residence, Weidart said.